The Arc’teryx Sphene is the lightest jacket in the Whileline collection and designed specifically for the demands of backcountry ski touring. 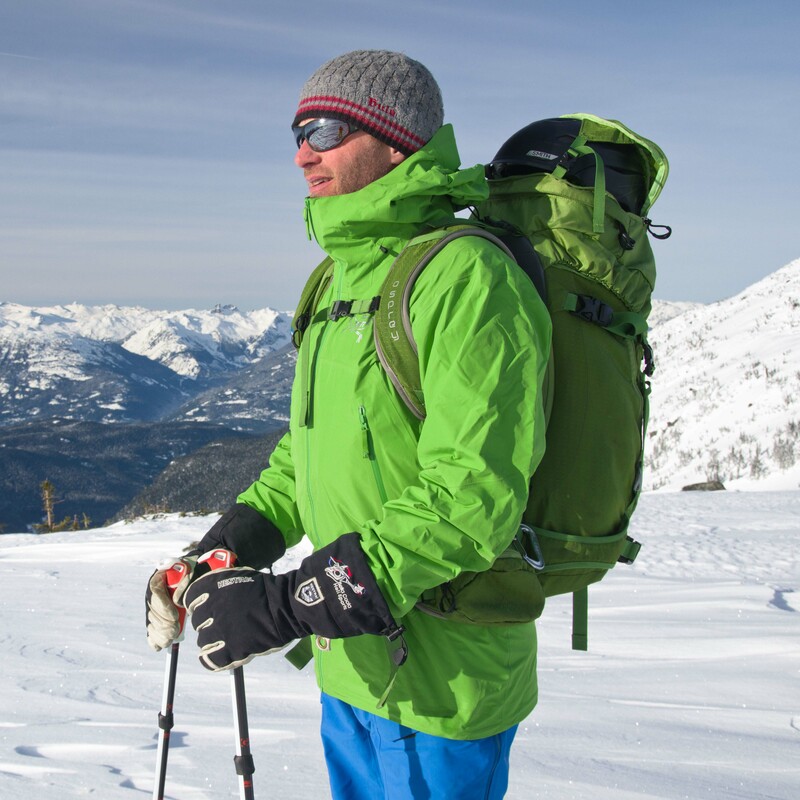 By stripping away features and pockets not needed in a ski touring jacket Arc’teryx was able to keep the Gore-Tex Pro fabric and still have a lightweight and packable hard shell. But how does it perform? Well after about 50 days of touring and ski mountaineering in the Sphene I’ve tested it in almost every condition imaginable and it’s a winner! 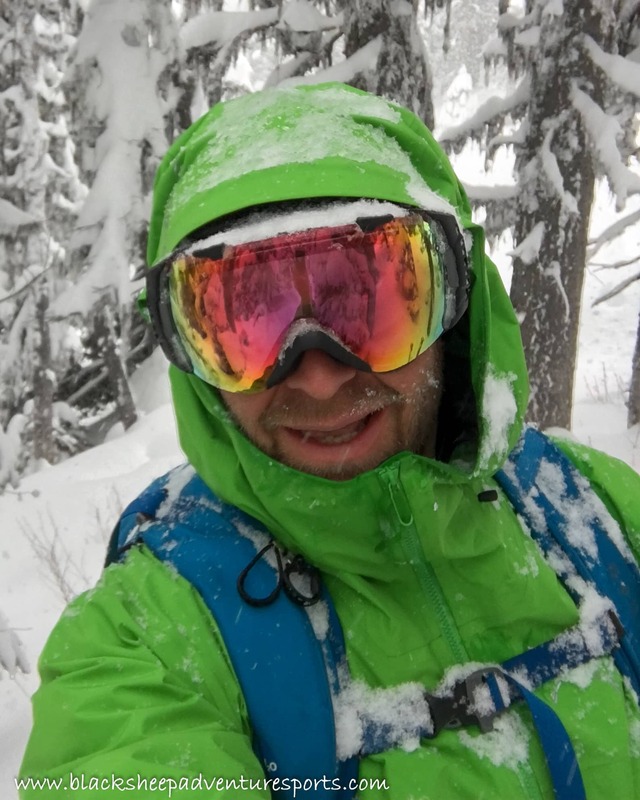 Testing the Arc’teryx Sphene on a Pow day. While the published fit for the Sphene jacket is “Regular” I found that it had more of an athletic cut. It will accommodate base and mid-layers but your puffy’s going on top, as it should. With the reduced fabric around the waist and the drop back hem the jacket keeps the drafts out and wears well under a harness or pack. 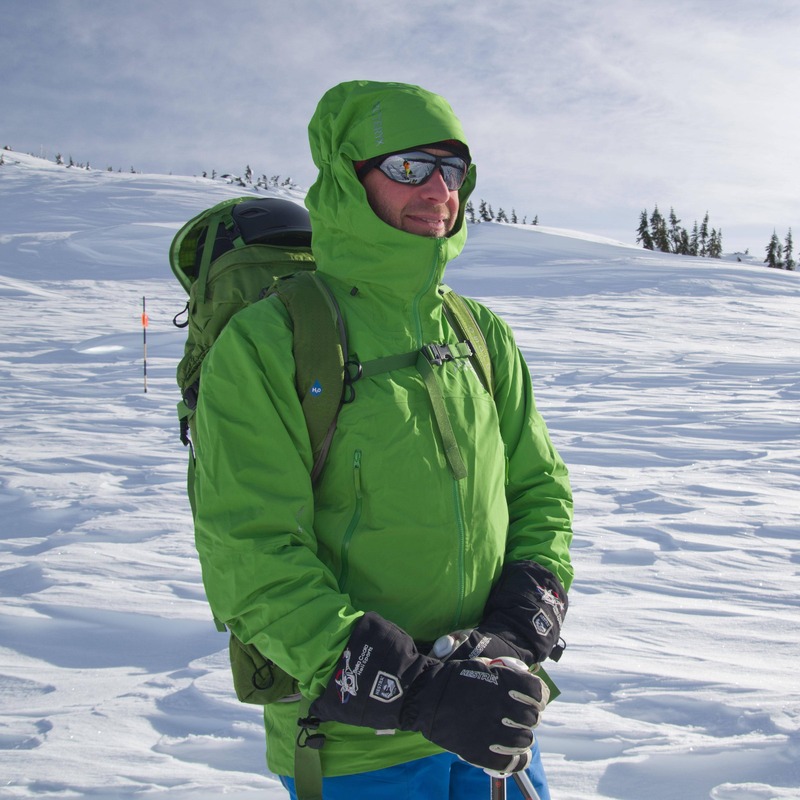 The articulated elbows, gusseted underarms and what Arc’teryx is calling e3D patterning provide a flawless fit with no lift in the jacket when the arms are raised and great mobility. Not at all restrictive like many hardshells. The pocket layout on the Sphene is quite minimal but still very functional. Externally there are a pair of zippered hand pockets, the left one features an integrated RFID ski pass holder. Internally there’s a zippered media type pocket on the left and a larger open-top pocket on the right made of a stretchy mesh material. For recreational touring I found this pocket layout more than adequate. The external hand pockets are set high so they’re still useful when wearing a pack or harness and the water resistant zippers more than adequate to keep out wet snow (I’d be careful stowing water sensitive gear in them if you get caught in heavy rain though). The mesh pocket works great for a pair of gloves or beanie when the gets hot on the up-track. The media type pocket is just the right size to stop my iPhone 6s from bouncing around however it’s a bit awkward to zip up with headphones plugged in. The only thing I missed was a chest pocket to store a VHF radio when guiding. The mesh internal dump pocket with a tallboy for reference. 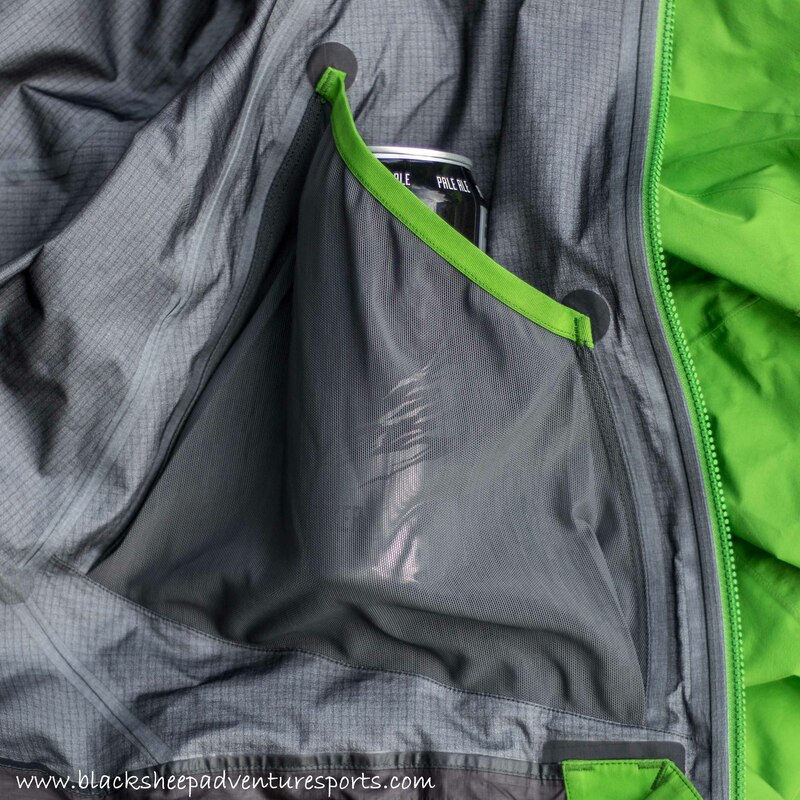 With a great eye to detail the armpit vents are angled and feature large webbing zipper pulls to make them a bit easier to access with a pack on and wearing gloves. The armpit vents on the Sphene are angled to make them easier to reach and they have large zipper pulls. The zippers on the jacket are water resistant not water proof but I never found that to be an issue given that it’s a ski jacket. The helmet compatible hood fits great without a helmet and good with one so long as it’s not too big. However, I’ve never liked wearing my hood over a ski helmet on the way down and I always take it off on the way up and so never tested how the hood would perform over a helmet when skiing. A thin powder skirt with rubberized sections to keep it in place is included on the Sphene. Though with the athletic fit and exceptional cut I never found I needed it to keep warm air in or snow out. Too bad it’s not removable. While Arc’teyx approached the design of the Sphene with a minimalist philosophy it’s still constructed of GORE-TEX Pro fabric with a soft facing material. 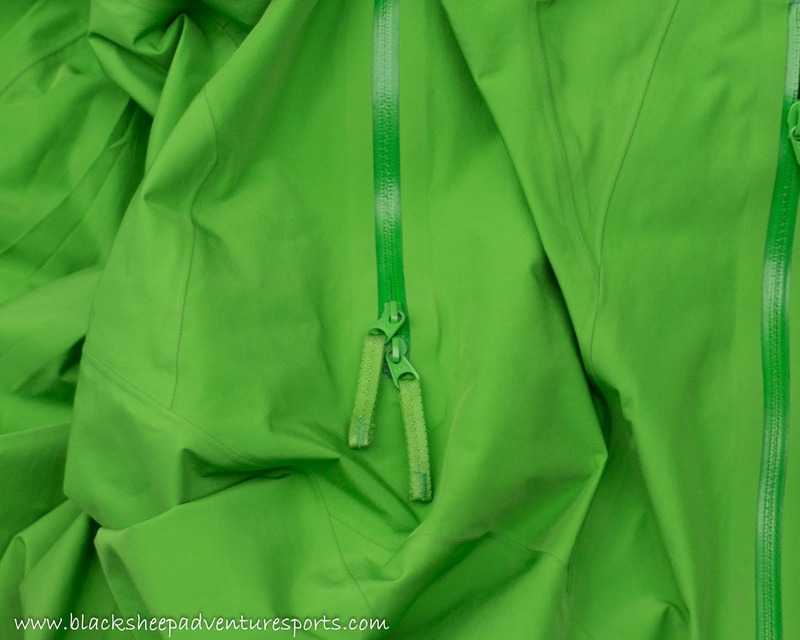 Waterproof, windproof and fairly breathable, this durable fabric has stood up exceptionally well on the test jacket and I expect to get a lot more seasons out of it. Pros: Great cut and fit, wears well under a harness and/or pack, durable. Overall: A fantastic ski touring and ski mountaineering jacket that also works well at the resort. A test sample of the jacket was provided for review but this in no way influenced the review.